For those of you who have had their iPhone’s tethering feature restricted by your carrier, here’s some good news: MiWi 5 has been updated today to support iOS 5.1.1. 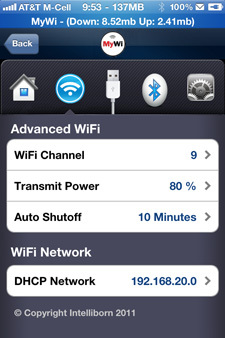 MyWi 5 allows your iPhone to share its 3G connection through bluetooth, WiFi, and USB, as with the iPhone’s stock tethering app, however it also includes a few exotic options such as several different modes of WiFi bridging, settings to adjust broadcast power to conserve battery life, and the usually annoying blue tether bar displays bandwidth used during your tethering session. The only downside is that, at $19.99, MyWi 5 is somewhat pricey for an iPhone app. However that is a one-time fee, and likely cheaper than what your carrier is offering for the privilege of actually using the bandwidth you paid for. If you have already purchased MyWi 5, the update is free, and that includes those of you who purchased the app when the Rock app store was a viable alternative to Cydia. You can find MyWi 5 on Cydia in the ModMyi repository. The Cydia page says it supports any jailbroken iPhone or iPad running 3.1.2 or later. Keep in mind that if your carrier is watching your iPhone’s traffic, they still may charge you a fee for using tethering. This update puts MyWi 5 on the list of iOS 5.1.1 compatible apps. You can check the list for your favorite apps here. Have you been waiting for MyWi 5 to support iOS 5? Share your thoughts in the comments section below. That’s a count of bandwidth used, not speed. Mywi have amazing features, it’s allow iPad to share 3G connection through Bluetooth, Wi-Fi, and USB as with the iPhone’s stock tethering app. However, it also includes a few exotic options such as several different modes of Wi-Fi bridging. Does the cracked version of mywi 4 work on iOS 5.1.1??? ?